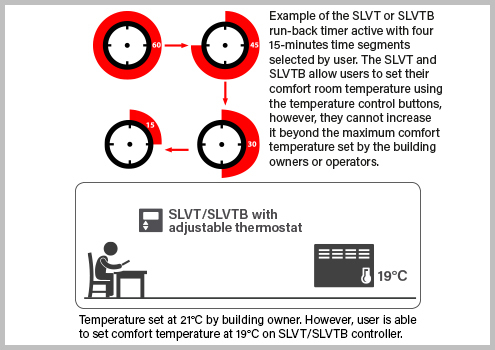 Provides similar functions and benefits as the SLVT controller except SLVTB is battery-powered. Status indicators are shown on the screen. – Temperature and Timer Control: Controller acts as a 4 stage run-back timer where heating period will be active until run-back timer expires. 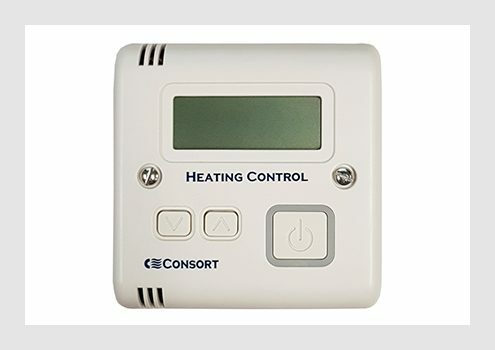 Target room temperature can be set using temperature control buttons. In Temperature and Timer mode, pressing the main button will briefly display the time remaining. Pressing it again adds on the pre-set time segment to the run-back timer. – ‘t’: Displayed in run-back timer mode when the heating is activated and flashes when the comfort temperature is reached. – ‘h’: Displayed in standard mode when the heating is activated and flashes when the comfort temperature is reached. Note: Supplied with single gang box and 2 ‘AAA’ 1.5V batteries.